Contribute: Wearable old/ new clothes, woolen, blankets, utensils, footwear, dry ration, sewing machine, umbrellas, school material, books, old cycle, toys, old audio/video cassette etc. and monetary contributions. Also contribute- Old newspapers, magazines and one sided used sheets also. 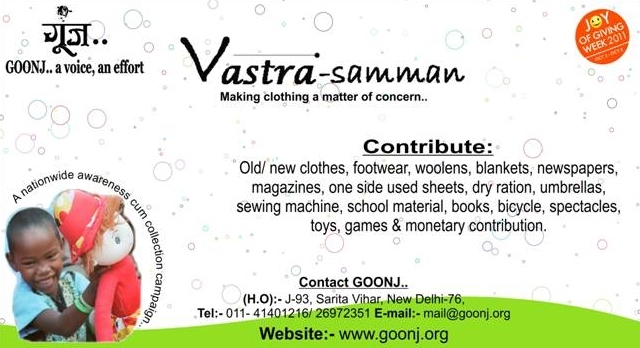 Resources generated will help us spreading the impact of Vastra-Samman much deeper!! Please share this message and spread Goonj..